Kept in the DARK – Mother Nature Will Always Have The Last Word! | "MASTERS"
Kept in the DARK – Mother Nature Will Always Have The Last Word! Posted on January 18, 2016 by Mark and Sarah - MASTERS! MARK: It had to happen. It did. We were gutted. And there was nothing we could do about it. Best laid plans and all that…. When we organised our trip to Australia many months ago, Sarah took the lead. She had been there 35 years ago, working and touring around this great country. 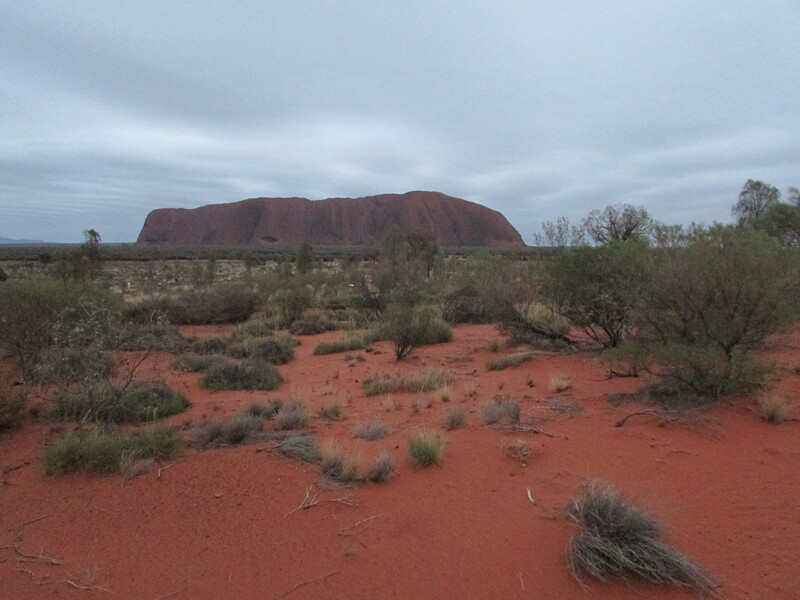 One of the few places she did not visit was Ayers Rock, or Uluru as it is now known in these Aboriginal “correct” days. We added it to the list of places we wanted to see. But it did take a bit of working out as it was a 1,200 mile detour to the Red Centre rather than flying straight to Cairns from Sydney – our final intended destination, Port Douglas in the tropical north. 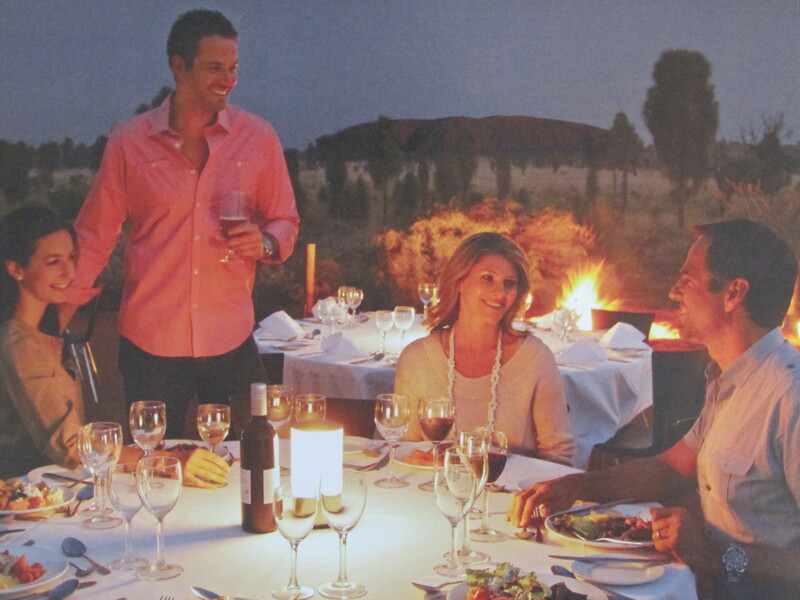 Book three hour Virgin Australia flight to Ayers Rock. Arrive at 1245 local time. Transfer to a “simple” hotel that we could afford (£125 room only, ensuite with two bunk beds). 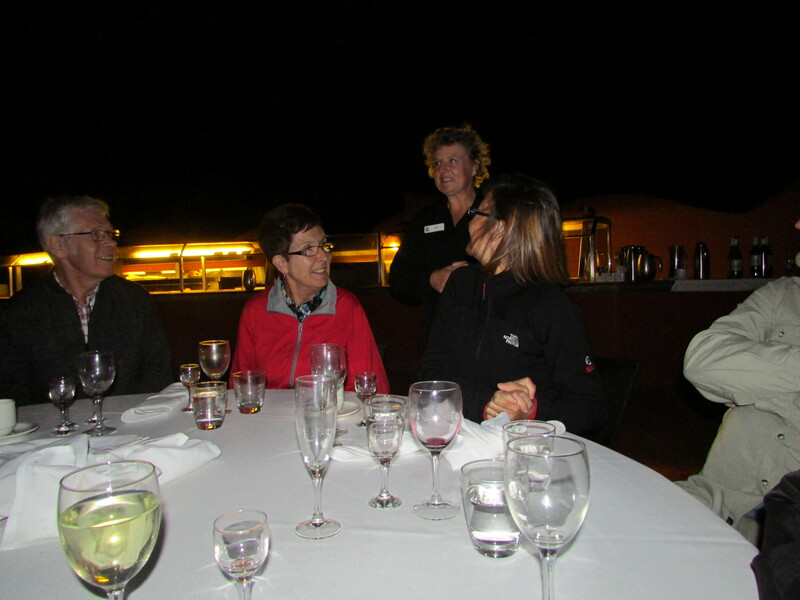 Brief kip before joining the Sounds of Silence (SOS) Dinner in the open air desert, overlooking the Rock. Watch spectacular sunset and then enjoy an astronomer talking about the sky at night, Patrick Moore style. 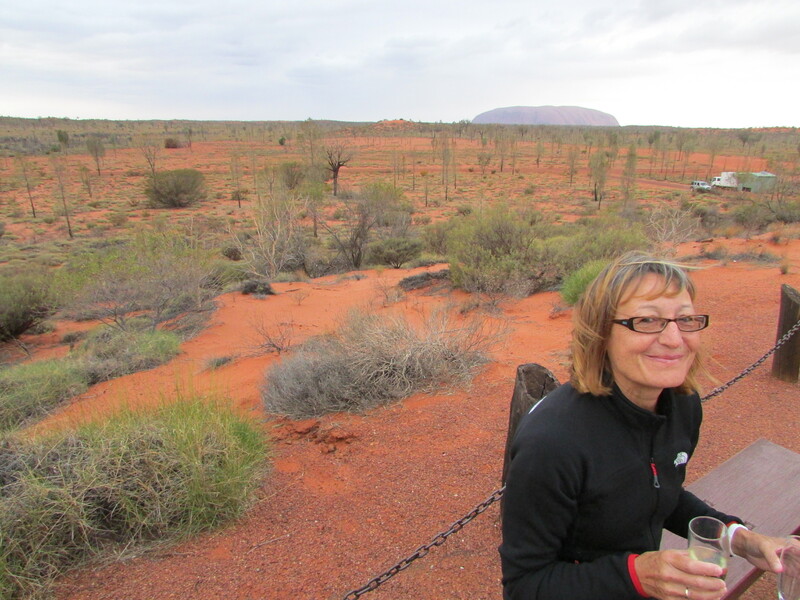 Next morning, get up at 0400 ready for the “sunrise” tour of Ayers Rock and the chance to see a beautiful red glow effect as the sun rose. Return to hotel at 0800, check out the visitor centre, attend a talk by a local Aboriginee Guide and relax for two hours before finally boarding the 1530 flight to Cairns. Sound like a plan? It was. Did it happen? NO! Could we do anything about it? Er No! So what went wrong? The weather, that’s what!! We were in one of the driest, warmest places on planet Earth. Temperatures of 40C + at this time of the year quite common. Just a handful of days a year when it rained. Cloud cover rare, sunstroke and dehydration common. So tell Mother Nature the stats! But as we all know she is not listening at the moment anywhere in the World. The warmest and wettest December ever in the UK proved that point. And here in Aus’ you can have 40C heat one day only for 20C to hit you the next. 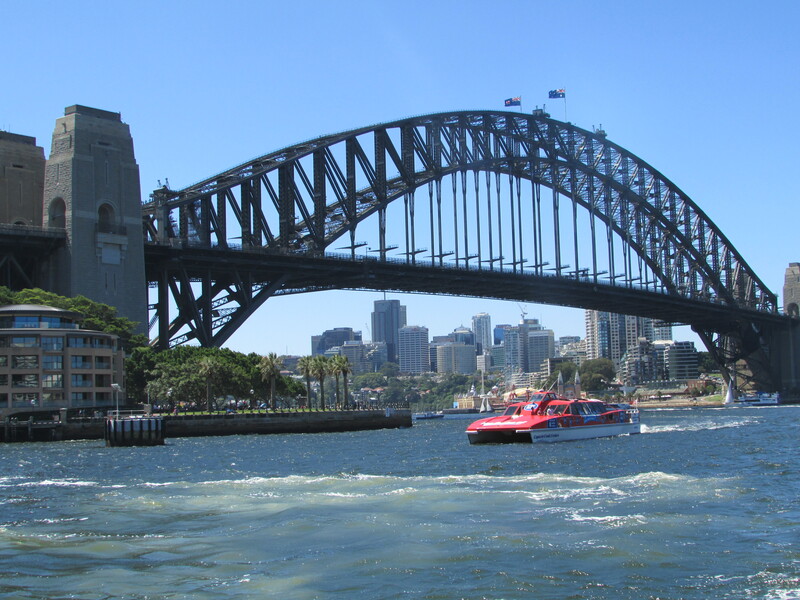 We’d had a great few days in Sydney staying at the superb Admiral Collingwood Lodge. 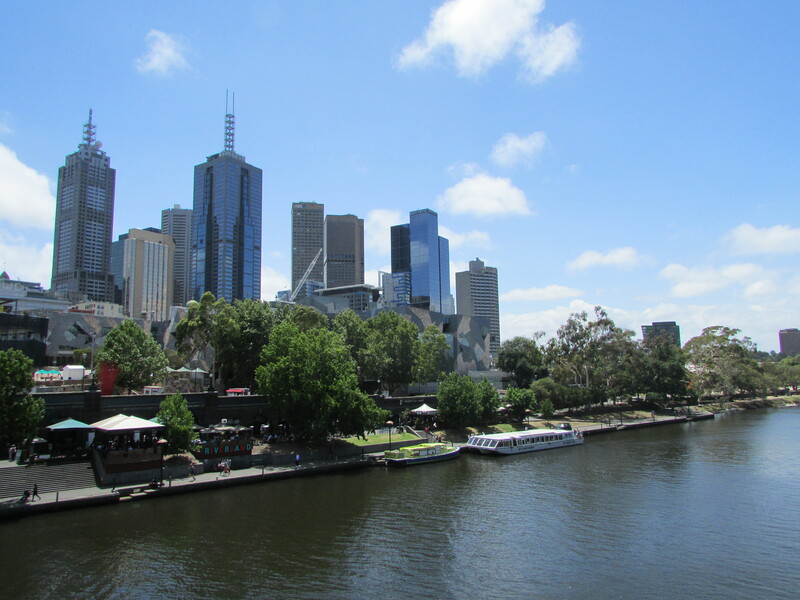 Beautiful weather, blue skies – perfect. Even the mighty Boro won against Brentford, prior to the diabolical loss against Bristol City at Ashton Gate. 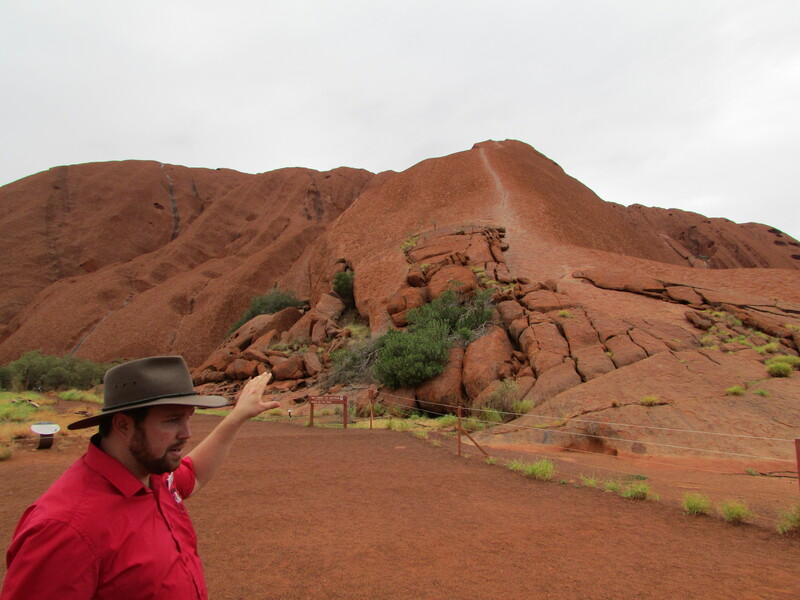 However, as we re-checked our Ayers Rock flight and accommodation online, we also checked the weather forecast. It could not have been worse. Two days of 100% cloud cover! Thirty percent chance of rain. Winds gusting up to 35 MPH. Temperatures between 17-25C excluding wind-chill. Surely the forecast was wrong? A quick check of two other online weather sites confirmed the same thing. A 36 hour cold front was heading straight though the centre of Australia! And we were in the middle of it. Worse was to follow as my mind quickly went into Plan B Organiser mode, the crowd cheering on the TV as an Adelaide Strikers’ player hit another six in their Big Bash Cricket Match. I fished out the confirmation of our Sounds of Silence (SOS) Dinner and read the small print. In summary, if dinner had to be called off because of the weather, they would try to book you on the next day or give you a letter to assist with your insurance claim for a refund of monies paid. Great! We were there for one night and secondly, what insurance company would pay out for a cancelled dinner due to rain or high winds? We prayed that night for good weather. It didn’t work. We knew we were in for a problem when the flight took 30 minutes longer than scheduled because of strong head winds. We also had to stomach over two and a half hours of pretty uncomfortable turbulence, the worst we had experienced on any of our 25 flights to date. Not nice on a small plane. There was no chance to look out of the window and see the marvelous red desert from 35,000ft. We flew in cloud for most of the way and only saw land on final approach, the ground below looking grey and seriously depressing as we touched down. 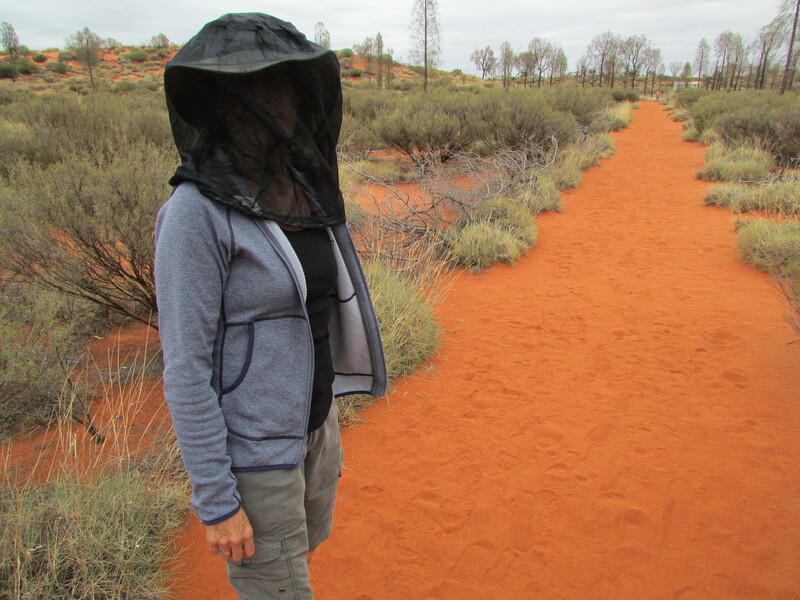 With just four flights a day, we breezed through Connellan Airport and 30 minutes after we landed, we were checking in to the Outback Pioneer Lodge. Ray Croydon – Sails in the Desert much better as you said! Bags dumped, Sarah was being optimistic as we headed off on a walk around the local area. “There’s bound to be a break in the cloud” she said as a gust of wind nearly ripped off her fly net! I had to laugh – we both looked ridiculous. But our planning and the transporting for five months of our two little head nets had not been a waste. Damn flies attacked us from all angles. We didn’t care. No flys on Sarah! Well actually there were, but not on her face. We did care though when we bordered the transfer bus for our “once in a lifetime” Sounds of Silence Dinner, in the middle of the desert. It was cold, very cold. Out came my North Face minus 20 fleece and North Face Gortex jacket. We needed them. Other Europeans and Chinese guests meanwhile were left shivering in their shorts and T shirts. They hadn’t the right kit, we were lucky. The man playing the Digeridoo had frozen hands and blue lips. Two glasses of champagne crashed off the table, blown by the now gale-force winds. 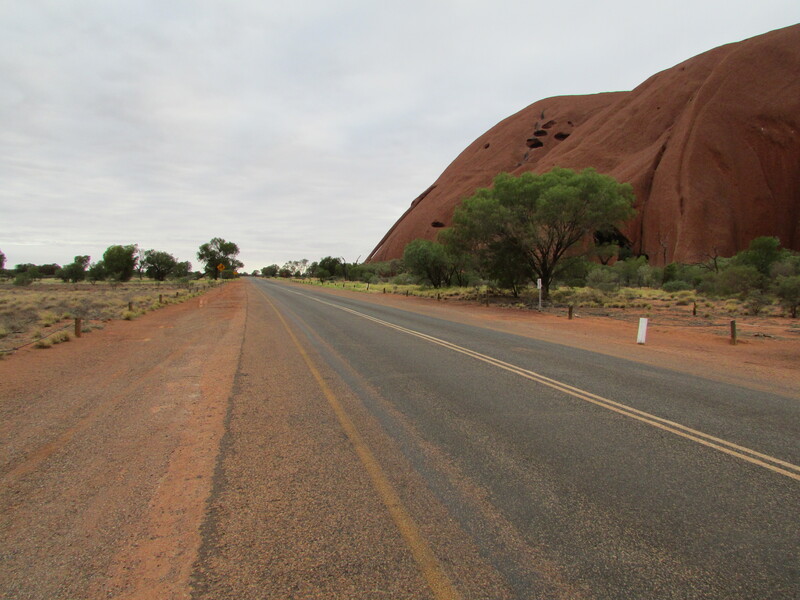 Uluru was hardly visible in the distance. It was grey, there was no sunset. One minute a murky outline, the next nothing. At 2230 we climbed in to bed. Midnight with the 90 minute time difference. Neither of us were looking forward to the 0400 wake-up call ready to see the sunrise. Would the weather be better tomorrow? Fingers firmly crossed, we fell asleep. 0430, head out of door. Damn. Strong winds, total cloud cover. Here we go again. Five “lucky” punters got on the AAT Kings Bus at 0435. The bus took 65 passengers – where were the rest? There weren’t any – what did they know that we didn’t? Peter, the Driver/Guide was a nice Aussie chap from Brisbane, who sipped at his bottle of water every three minutes even though there wasn’t a cat in hell’s chance he would ever get dehydrated. 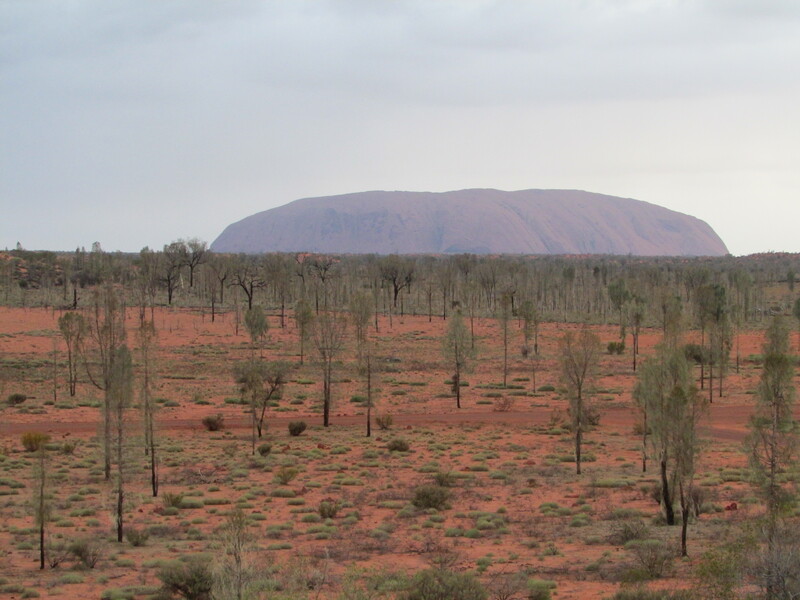 Twenty minutes later and the black looming shape that was Ayers Rock came into view. We grabbed a coffee in the car park, and walked through the arid desert, to the raised vantage point. But what was the point? Other than a change in the murky lighting, there wasn’t going to be any Eureka or Wow moment this morning. By 0610 the sun had risen. We didn’t know, we had to be told. So, back to the bus. But then some good news! 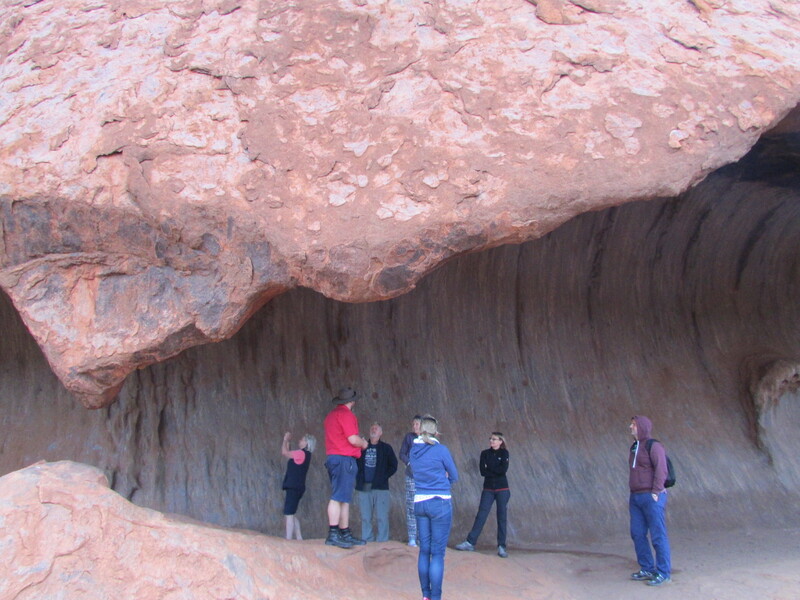 Because there were just five of us on our big bus we had time to go “walkabout” close to the base of the Rock. Suddenly the mood amongst us and our fellow travellers’ lifted. We got off the bus and walked a few minutes right under the towering sandstone face of the west side. The pitted surface was clear to see and touch. The overhanging rock formations housed interesting carvings. A full water hole reflected the grey light having been refilled from the downpours that the area had experienced 48 hours before. We saw the chain links up the side of the Rock which Sarah’s Dad, Dennis had scaled 20 years before. 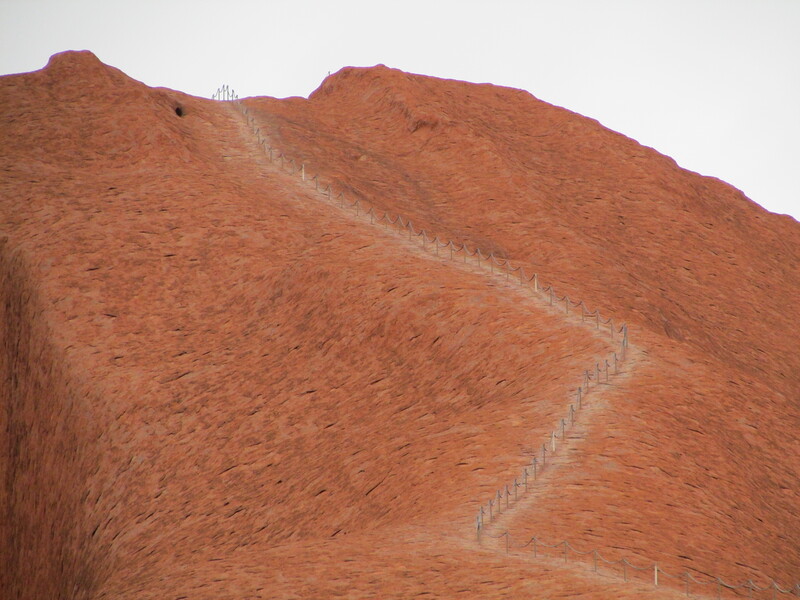 These days few climb at the request of the Aboriginees. Fair enough. We headed back to the hotel, walked around the local centre, had a cup of coffee and caught up with emails from Barclays Bank that we needed to action. At 1330 as the shuttle bus arrived the sky began to clear. At 1500 as we boarded the old Qantas Boeing 717, the sky was virtually blue. The temperature was in the late 30s centigrade. I asked an Aussie security guard what the yellow thing in the sky was… he laughed, I didn’t. One last throw of the dice though… I’d asked (and got) Emergency Exit seats. I’d gambled that we would be taking off right to left on the desert runway and specified seats 7 A and C. That meant we’d have a view of the Rock as we had took off. But the winds direction changed at the last minute and yes, you’ve guessed it, we took off in the other direction – our Cambridge dinner friends enjoying a ringside seat from 5000ft. STOP: END OF BLOG WRITING ON FLIGHT, RAN OUT OF TIME. We’re in Port Douglas and have had two magical days in the northern Queensland tropics. The Rainforest has been amazing and the snorkelling on the Barrier Reef literally out of this World. Sarah has snorkelled for the first time using prescription goggles. 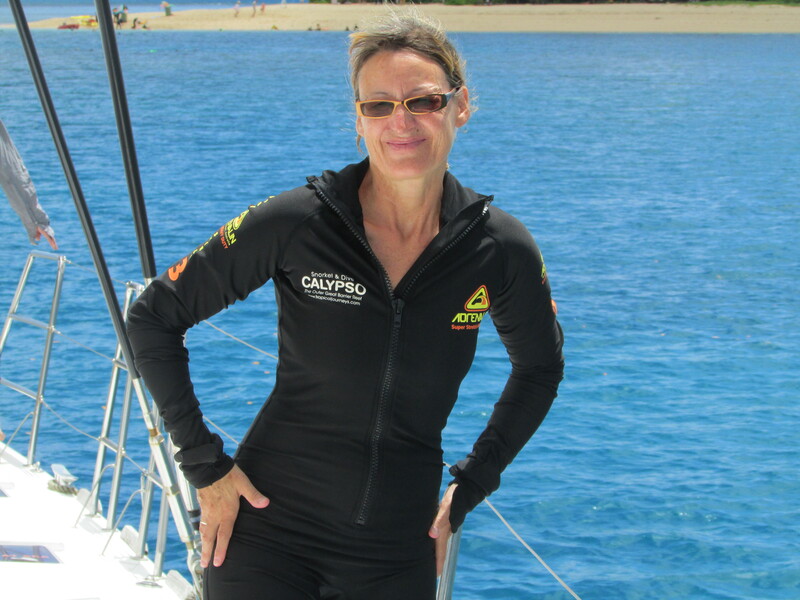 It was not an exaggeration to say it was like a blind person seeing for the first time as she could see the beautiful coral, fish, turtles and reef sharks. This trip is all about Mother Nature and you pays your money and you takes your chance. So, Sarah is now happy that I have “got over it”. Life moves on and there are, as we are constantly reminded much worse things to be upset or worried about than cloud cover at Ayers Rock. Sorry to hear about your disappointment at Ayres Rock. We were luckier as we arrived on Australia Day Jan 26 and witnessed a glorious sunset. Next day very early we completed the circuit around the base of the rock. It took over two hours. You don’t realise how big it is. Like you we did not climb it! We were glad of our fly nets too. Mastered drinking through them but eating was a bit tricky! !We are off to Malta today for 10 days. Yes not very exotic but nice to get away from the cold temperatures we have experienced these last few days. Enjoy Queensland. Stay safe. Always look on the bright side hey Boss. Thanks Pet… hope life in Northumberland is canny but not too cold! Thanks Ian… as always wise council or is it counsel? So great you could snorkel Sarah. I seem to remember that swimming in the sea let alone snorkel was not necessarily your favourite pastime! It must have been amazing and I am very envious.